This story originally appeared in the November 13, 2005 edition of the South China Morning Post (subscription only). While the hordes were hovering behind Tiger Woods as he practiced at the driving range Saturday morning, Ian Poulter worked on his putting a couple dozen meters away. There was no crowd surrounding the Englishman, but nearly everyone who walked past him did a double take, stopped and took a photo. Why? Poulter’s pants, of course. Much has been written about the maverick 29-year-old, his outlandish attire, spiky highlighted hair and reflective sunglasses. 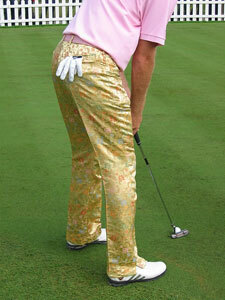 And, pants-wise, Poulter brought his A-game to Shanghai — four pairs spun from ornately embroidered Chinese silk. Poulter’s special China line of pants, like all of his more garish offerings, was designed by William Hunt, the famed tailor from London’s Saville Row who is also a favorite of David Beckham. Saturday’s edition was particularly bold: shiny and gold, with tiny stitched flowers of orange, green, red, blue and, yes, pink – the color he chose for his matching shirt, visor and snakeskin belt. “He’s pretty cool, yeah?” said Shanghai resident Song Barnes. She had just had her photo taken with Poulter in the clubhouse after his round on Saturday, a disappointing 1-over 73 that left him tied for 12th at 7-under, nine strokes behind leader David Howell. But Barnes didn’t appear to care. She said she was going to get the photo printed that night so she could have Poulter sign it on Sunday. She wanted to hang it on her wall. Poulter said he started getting more creative with his tournament clothing a few years ago, but he upped the ante with his anti-establishment gear in 2004, when he caused a stir with Union Jack pants during the British Open and American stars-and-bars trousers for the PGA Championship. This year, the BBC let readers submit designs for Poulter’s British Open pants. He wore the winning effort, which featured a big image of the Claret Jug on his left leg and a list of past Open winners on the back of the right leg. Poulter never wears his designer pants more than once. It’s one and done and then they usually go to one charity auction or another, where they often fetch between 1,000 and 5,000 pounds. Poulter’s Shanghai collection might be a little more difficult to say goodbye to than most, though — he’s liking the way the Chinese silk feels against his skin. Filed under Blog. Tagged china, danwashburn, golf, hsbcchampions, ianpoulter, scmp, stories, tournaments.